Now all the dogs in your life can (sort of) look rough and tough with this free pattern Ok, so a spiked dog collar is not amigurumi, but it is FOR cutie animals! You can customize the pattern to fit your own dog and I include step-by-step photos throughout. 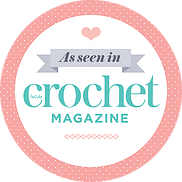 This is an easy level pattern that involves single crochet, magic ring, increasing, and attaching pieces. I’m having trouble making the spikes. I can’t seem to get them shaped correctly. Do you happen to have a video tutorial? I am having trouble downloading the pdf do to very slow connection… is there away you can post the pattern in here ? I have changed the file so it is MUCH smaller now. I prefer not to post the pattern on here because I have a lot of images and formatting in my patterns, but hopefully with the smaller file size you can now download it! I made it for her, it is an easy pattern to follow and it is such fun to work on it. Also comments that we got outside on walks are great! Thanks for making this pattern! oh yay!! Thank you Tanja 🙂 So happy you and you doxie princess like it!